The millennials are supposed to be known by tight credit, higher student loan debts, and high unemployment. However, for many, they are not only doing well but are actively looking for someplace to call their own as they begin to raise families and get settled into careers. Despite these challenges, or lack thereof, many real estate agents are eager to sell homes to millennials. Why? Millennials are changing real estate markets...read on to find out why and how! There are many stereotypes and assumptions that millennials do not buy homes. While some of those assumptions may hold true to millennials home buying habits, some of them are quite off-base. The truth is that nowadays the Y generation holds a lot of buying power in the real estate market. Statistics show that more than 60 percent of the current real estate market in the U.S. comprises of buyers between 18 and 36 years old. Sellers know very well that this number will continue to increase, the reason they want to get their homes ready to sell to millennials. Some home buyers, especially those in the older generation, will question everything agents' say. This is not the case with millennials. They do not want to take chances when an opportunity presents itself. According to a survey conducted by Fannie Mae, the majority of millennials who responded revealed they consider buying a home a smarter and sensible move compared to renting a property. By targeting millennials, sellers know that they will be faced with fewer challenges trying to motivate them. Sellers also want to sell their houses to millennials because this category of buyers put mortgages first before anything else. In some cases they will commit a considerable amount of their salaries to pay off the loans. For instance, Chantel Bonneau, a wealth management advisor at Northwestern Mutual says that many individuals from the generation Y are delaying marriage and kids by almost 10 years in order to buy a home. It is not uncommon to sell homes to singles or couples who are living together. The Y Generation embraces technology more than any other generation. This generation is more likely to use online resources when searching for homes to buy. Around 90 percent of individuals in this generation will incorporate online resources in their home buying process, with 66 percent utilizing affordable tools and more than 25 percent of them using various digital platforms to judge mortgage options. Savvy sellers also want to target millennials because when it comes to communication, this generation knows how to utilize the various options available to them. They have grown up with technology and are very comfortable with it. 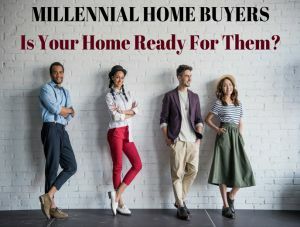 Another reason sellers want to sell homes to the Y generation is that millennials are savvy home buyers who know what they want. For instance, they want technological efficiency and healthy living, homes with open floor plans, smaller but efficient rooms or homes with low maintenance. This is in contrast to other generations who are not also positive what they want in a property. With Generation Y, they have done their homework and know what they want in a property. While we have seen many millennials moving to big towns and cities over the last 10 years, we are now starting to see many of them moving to rural areas and suburbs. This means that millennials are flexible people who can adapt to any location and situation. They can buy homes anywhere from suburbs and rural areas to small towns and big cities. In fact, a boom in small businesses, available jobs, low-cost housing, beautiful landscapes and increasing diversity are contributing to the generation’s redefining cool in unimaginable places. Even if they miss a house in a preferred location, they can still consider other options in the forgotten parts of the country. The Y generation has a broader diversity within the home buying scope compared to other generations. Of the millennial homeowners, around 66 percent are whites, 17 percent are Hispanic or Latino, 10 percent are black and 7 percent are Pacific Islander or Asian. This means that even if a seller has a home in a particular suburb demographic, they will still find buyers from that demographic in the Y Gen who will want to see the home. At the end of the day, it is important to know that there are sellers out there who are ready to do everything in their power to provide the home you want. Whether you are weighed down with problems or are ready to make an immediate move, there are options available to you. Happy house hunting!